Schools are places where students spend a considerable amount of their time and energy. In these spaces they learn not only how to engage with academic content but also social skills and skills to navigate through life. Schools are key settings for taking care of students’ mental well-being and inculcating in them the courage to live when facing adversities in life. It’s about time that schools and educators stop taking the mental health of students for granted. The recent statistics from a National mental health survey (2015-2016) by NIMHANS clearly indicate that 7-8 per cent of high school students have attempted suicides; at least one student commits suicide every 55 minutes in India and there is an increase in anxiety and depression among school students. The statistics are quite alarming and clearly highlight prioritizing mental health as the need of the hour. There are numerous issues that students grapple with in and outside the schooling system. They handle tremendous amount of stress related to academics, family, peer group and development of self. Schools can provide them with an atmosphere where they can learn to handle these challenges. With the rise in the number of suicides among school-going students (due to reasons ranging from online games to excessive parental expectations), it’s important to address the need for schools to take a proactive stand in preventing suicides and making the school environment conducive for a student’s overall well-being. The time is ripe to push for a comprehensive approach to deal with mental health issues and prevent suicide in school settings rather than have a piecemeal approach to handling crisis as and when it arises. Why is it important for schools to have a proactive stand to prevent suicide? Schools are places where students spend almost 30 hours every week. It’s important for every school to provide a safe school environment. They are key to teaching students self-care, self-acceptance, problem-solving, stress management, resilience and empathy. Students are more amenable to pick up these skills when they are in school and have relatively more time to reflect on their own growth. Psychological well-being is inextricably intertwined with the students’ academic performance and overall health. Research studies have clearly shown how emotions and motivations play an important role in learning. If a child’s mind is occupied with anxiety and stress, he/she will find it extremely difficult to learn and engage with academics. Suicide not only affects the immediate family but the entire school community. Everyone gets affected to some extent. Suicide, most of the times, leaves a lot of questions unanswered and makes people who witness it from close quarters struggle with finding closure. What role can schools play in suicide prevention? Schools can promote emotional well-being and a community feeling among the students and teachers by embedding the message of compassion and care within the ethos of the school. This will include providing students opportunities to build supportive relationships within the school, having supportive caring adults or mentors who can help protect students despite the presence of other risk factors. Connectedness can be encouraged and enhanced through a variety of social activities, outings or cultural programs which reduce a sense of isolation and foster connection among the students. These activities can also highlight the need for addressing mental health issues/stress by talking about them more openly and making them a part of regular conversations. For e.g., school clubs, music groups, newsletter, debate team, theatre, volunteering groups and sports groups can include discussion and activities to talk about mental health and ways to manage stress. Schools can help students build life skills, such as problem solving, stress management, self-care, and resilience through hands-on activities and courses which can be a part of the formal curriculum or taught through other co-curricular activities. Resilience has been seen to act as a protective factor against suicide. Resilience also comprises optimism, self-acceptance, inculcating gratitude and finding meaning which enhances the ability to remain hopeful. All these can be inculcated by incorporating them in simple deliverable lessons within the various subjects apart from exclusive modules for teaching these. For e.g., while teaching arts, students can be asked to reflect on the words ‘feeling good’ or ‘flourishing’ and create their own personal artwork based on their understanding, or in science or social science, reflecting on what could be the various physiological, social and cultural factors involved in making an individual ‘stress free’ or ‘happy’. It’s important that the school offers training and support to its staff to make them more skillful in identifying warning signs in students who are at risk and screening for suicidal intention as many students in distress may not proactively seek adult help. Learning how to support sensitively when somebody’s in distress is an important skill to learn for the educators. It’s also important to teach students to recognize when they need help and identify peers who may need support. Students should be taught to lower their barriers to obtaining help and educate them about resources which can be useful in case of a crisis. A key element for preventing suicide is to ensure that students who are in extreme distress have easy access to mental health professionals who are competent and can provide evidence based treatments. Trained professionals can play an extremely important role in mitigating suicide risk by accurate assessment and the right kind of intervention which will be useful for recovery. It’s also important to involve various support networks that will contribute to the care of the students. In case of clear suicidal threat, it’s vital that the information is sensitively shared with immediate family and caregivers who can form a part of the safety net. The family should be educated about the intensity of the risk and the measures they can take to keep the student safe (like reducing access to means of suicide). 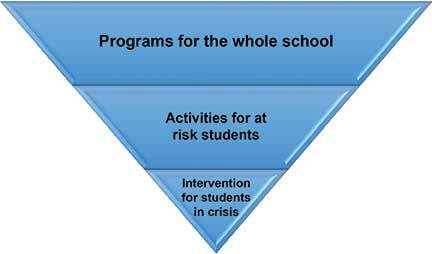 In case of a crisis, a school should have clear protocols on how to respond effectively to the student in crisis. There should be clear guidelines about whom to contact immediately, protocols for the crisis team and individuals responsible for support through hospital emergency services. The crisis team should be able to also respond to the needs of the peer group supporting the student in crisis. In case of a successful suicidal attempt, the school should have a clear postvention plan. This will include ways to respond compassionately and supporting people who have been affected. In case of an unsuccessful attempt also the school should have a clear mechanism in place to help the student who attempted suicide integrate well with the community. The capacity to flourish forms an important component of most of the mission and vision statements across schools in India. Psychological, social and emotional well-being are integral to help a student flourish. It’s important for all of us as educators to reflect on the various ways in which we can help our students flourish and not give up on life. Using a comprehensive approach would be the ideal way to design programs and activities to build supportive communities and give students the right tools to fight with adversities and stress. 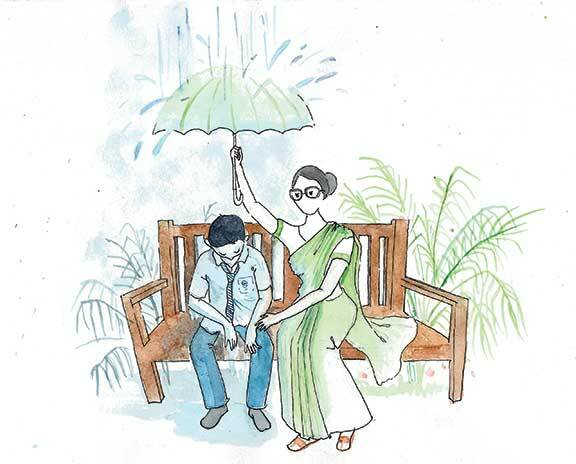 National Mental Health Survey of India, 2015-2016 Prevalence, Patterns and Outcomes, Supported by Ministry of Health and Family Welfare, Government of India, and Implemented by National institute of Mental Health and Neurosciences (NIMHANS) Bengaluru: In Collaboration with Partner Institutions; 2015-2016. Prevention of Suicide: Guidelines for the Formulation and Implementation of National Strategies. (1996). United Nations. The author has been teaching Psychology at Azim Premji University for the last five years and is also coordinating the activities of the mental health and well-being centre at the School of Liberal Studies. She is a licensed clinical psychologist and has been working in this field for almost a decade. She can be reached at anindita.bhattacharya@apu.edu.in.